I received the locket pictured below for the purpose of this post. All opinions are my own. Jewelry is something that nearly any woman would love to receive as a gift, but how about going one step further and personalize it?! I have been absolutely astonished at the speed and beauty of the product from PicturesOnGold.com. I can understand some people's concern over placing personalized orders- especially online. Since you aren't sure exactly what you are getting. PicturesOnGold.com has launched the "Design your own Locket" app on their page which offers a full preview of what your piece will look like so you can double check everything and get a see how your personalized piece will look. The locket has 4 customizable areas. 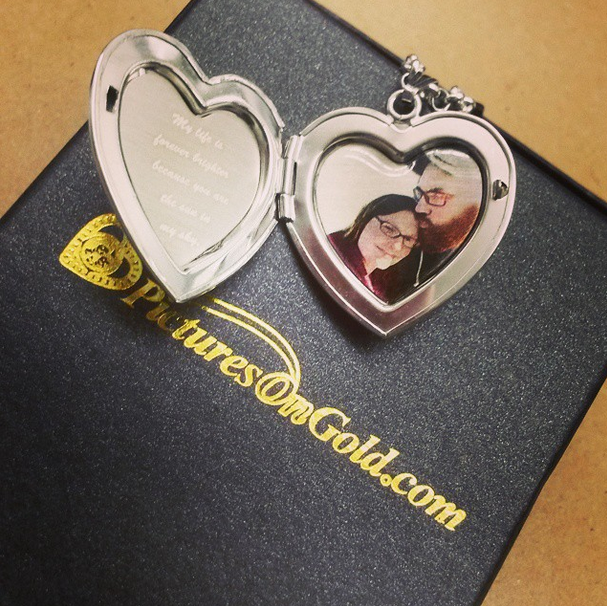 The front of the locket is customizable with over 1000 different letter and clip art choices! I chose a simple, but elegant, letter for the front of my locket. I've always been wary of pictures put in lockets, if water gets splashed on them, or something happens they can be so easily ruined (or fall out). The picture engraving option is absolutely worth the piece of mind that the photo won't be scratched or ruined by a drop of water. The engraving is really nice, and they even took out the unnecessary background so that the photo only included the two of us! The photo of this locket really doesn't do it justice. It is gorgeous in person. The one thing I would change is the chain. I chose the rolo chain, and I'm just not very fond of it. There are two other choices, as well, but I think it is difficult to see when ordering because of the sterling coloring of the chains and the white background. The rolo chain's size was also much bigger than I expected (I thought it would be more dainty), so the chain images may be much smaller than actual size. You can also have an inscription on the back. I chose to personalize all 4 areas of my locket, and it will be something I cherish forever. Even though this is obviously for me, it really touched my husband that I chose a locket to wear that focused on our love. Lockets aren't only to keep photos of your spouse, though, they can really hold anyone that is dear to you close. This would definitely make a great gift for a loved one. I think it would be an amazing holiday gift to get for someone who has recently lost someone close to them. A sweet gift to hold the person close to their heart, with a favorite, or remembered, saying from their loved one engraved as well. I know of a couple friends who I think this would be a perfect gift for since they both have lost a parent in the recent months. 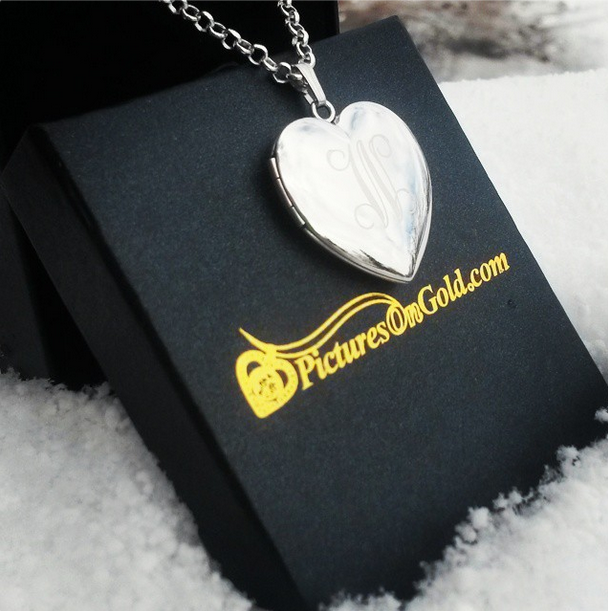 Be sure to follow PicturesOnGold's social media accounts for the most up to date information and sales! You can also enter to win one of these amazing lockets right here! Just enter using the form below. Prize fulfillment will be in the new year and not available before the Christmas holiday.